Hail Damage | Brandon, FL | Dynamic Roofing Concepts Inc.
Hail can cause significant damage to roofs, depending on the size of the hail and the type of roof. At Dynamic Roofing Concepts, Inc., we accurately assess your roof to determine the exact damage. We then fix any issues with professionalism and integrity. When it comes to Tampa roofing companies, our commitment to excellent service makes us stand out from the rest. Hail affects different roofs in different ways. A skilled contractor will know what to look for with each type of roof he or she inspects. While damage is also dependent upon the size of the hail, roofing materials crack and split according to their properties. Asphalt and Composition Shingles — This material turns black when hit by hail. The damage is often random with no clear pattern. The asphalt or matt can look shiny, and the roof felt may be exposed due to a loss of granules. The hail hits may appear soft to the touch in a similar manner to a bruised apple. Wood Shingles — The hail damage on this material is also random and lacking a clear pattern. 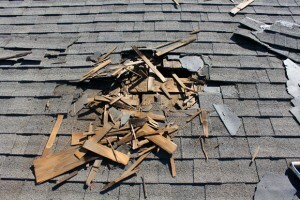 The shingles may split and expose a brownish-orange color. Splits have sharp edges and corners, and the edges may have little or no deterioration. Lastly, impact marks or dents may be visible along the splits. Metal Roofs — Since metal is highly impenetrable, metal roofs often receive no hail damage except what is cosmetic in nature. Cosmetic damage usually occurs due to large hailstone sizes, while small hail will have little to no visible impact. At Dynamic Roofing Concepts, Inc., we have over 40 years of experience handling all different types of roofing needs. We’re a family owned and operated business that is dedicated to treating its customers with integrity and honesty. As members of the West Coast Roofing Contractors Association and the Florida Roofing, Sheet Metal and Air Conditioning Contractors Association, we believe in the importance of quality service and professionalism. To get started on your hail damage repair, or any other roofing repair or replacement in Tampa, call our office at 813-257-9355. Our roofers in can get your roof looking and performing its best again.